I went ahead and promised a review on this sword: http://myArmoury.com/talk/viewtopic.php?t=33447, so here it is. I hope Mateusz doesn’t mind, but I’ve re-posted some of the pics from that thread, as his photos are so much better than mine! In late 2014 Soren from Albion Europe announced that he was closing down, and that from September of 2015 would no longer be trading. To us in Europe it meant that we would no longer be able to source an Albion sword unless we wanted to incur (for me, at least) high postal/ customs and excise charges from the States. Soren did, however, say that if orders were placed by the end of January then they would be submitted to Albion and delivered before he closed down in September. I procrastinated as a long as I could, but in January 2015 I took the plunge, ordered a Sovereign from Soren, and settled down to wait. Unfortunately it wasn’t to be: Albion were unable to complete my order by September 2015, so I got a very apologetic e-mail from Soren explaining the situation instead. Albion did, however, offer to continue with my order, if I so wished, together with a discount to off-set the extra shipping cost. These things happen, and ultimately I decided to cancel my order, despite Albion’s generous offer. Now, this left me with some money to burn! I umm-ed and ahh-ed for a little while, but thanks to a forum post on this website by Patrick Kelly in October, my attention was drawn to a Polish Smith on Facebook called Mateusz Sulowski who was doing some very nice work (https://www.facebook.com/sulowskiswords/#). I was soon in contact asking about prices and whether or not he had a slot coming up on his waiting list. Mateusz responded immediately and after a bit of back-and-forth I was on his waiting list with a date of completion quoted as the end of March 2016. For an overview of the Type XIV, I advise you visit the Features tab above, or grab a copy of Oakeshott’s The Sword in the Age of Chivalry from Amazon. Briefly, a Type XIV can be described as a short, broad-bladed single-handed sword with an acute point and single – sometimes multiple – fullers extending for roughly half the length of the blade. This type of sword would be often used with a buckler, and would be well suited for practising I:33 forms. 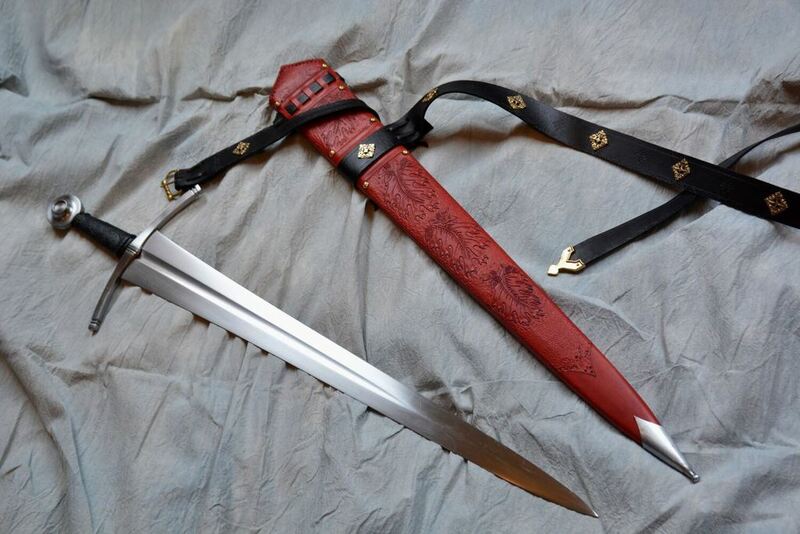 Mateusz does make accurate replicas of specific swords, but this one is more of an example of a type. The sword arrived at my workplace, as requested, in a box. A big box. A bloody great box. A bloody great big box which I then had to take home on the bus. No kidding, I weighed it when I got home and the box and contents weighed 12.1 kg (26.7lbs)! 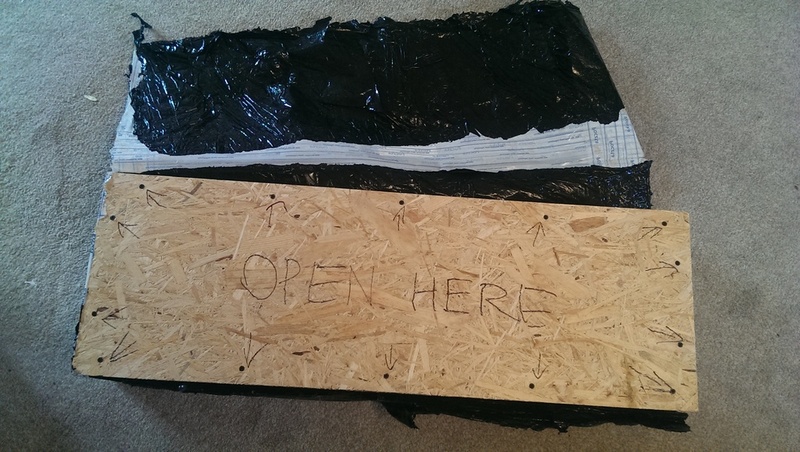 It was indeed a sturdy lump of wood: you can’t be too careful when transporting things overseas. The box was secured with 14 screws. 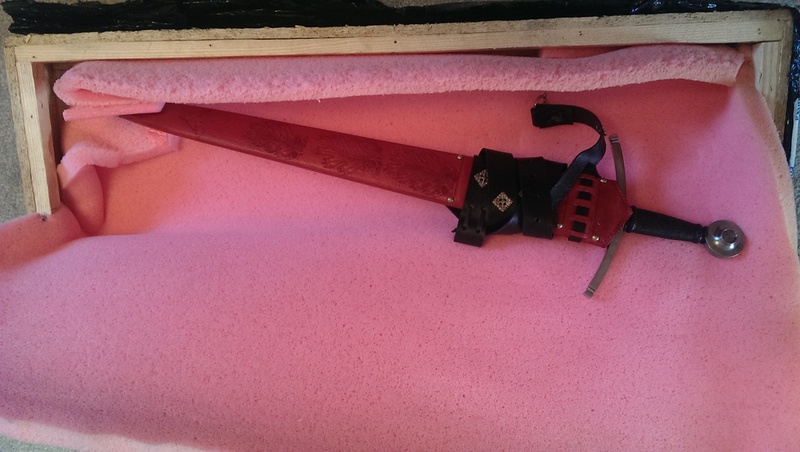 Within the box the sword was wrapped in plastic wrapping, and surrounded by very thick foam sheeting. Needless to say I doubt that this sword felt its journey. Mateusz delivers the sword with a scabbard and belt as standard – a lovely bonus and something that sets this apart from other higher-end swords, and one worth mentioning. When discussing the fine points of the sword, Mateusz offered a couple of options as far as colour and tooling went. 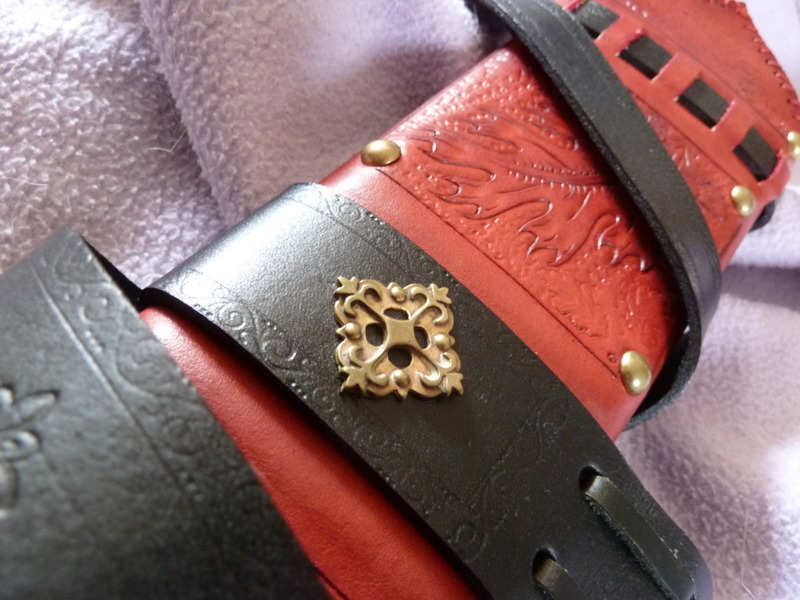 I decided to opt for the oak leaf and acorn design in red, with a black belt. I also asked if it would be possible to have additional tooling on the grip: Mateusz offered this with no additional charge. Up until now I had seen very few smiths/ companies offering tooled grips, and I was both excited and eager to see how it would turn out. As an example of the type, this sword excels: as the stats hint, it’s incredibly handy and nimble. I have owned several single-handed swords in the past, but I can really only compare it to the A&A Henry V and the Valiant Armouries Bristol: they are all of <similar> size and dimensions. Each has its own pros and cons, but as far as light, nifty cut-and-thrust swords go, this one just about pips them at the post. I found that it performed better when wearing gloves: I don’t think my hands are massive, but the grip is a little slim for me, and the extra bulk of the thin leather gloves was enough for me to notice the difference. The gloves also help with the stitching rubbing against the hand. Rightly or wrongly I prefer to have the stitching under my fingers rather than in my palm. If I grip the sword otherwise, the stitching does tend to rub a bit on the webbing betwixt Peter Pointer and Tom Thumb. It might just be my soft lady-like hands, though, and those manlier specimens amongst you may find that your experience differs. The blade tracks well, and, although I haven’t yet tried cutting anything, it whistles through the air when my form is good, encouraging full-arm cuts and quick recoveries. I would normally finger the guard when handling a sword like this, but with the base of the blade being so broad, it makes it nearly impossible. Even so, I don’t feel as though the handling suffers because of this. The blade is evenly shaped and ground: the edges are symmetrical all the way to the tip; the flaring at the cross is done evenly and there is no wavering. There is also no wavering in either of the fullers: both are dead-straight, and transition nicely to the slightly raised mid-rib (something which was not uncommon in Type XIVs, but usually a characteristic of Type XVIs). There is obvious distal taper, although I don’t own a decent set of callipers, so couldn’t take measurement. There are no visible hammer marks either. The polish on the blade is probably one step below an Albion finish: in certain light oblique sanding marks are visible. I’m actually quite happy with this: I feel less worried about ruining the finish should I wish to attempt any practice cuts; and a little bit of time spent with some fine abrasives should bring it up to a much higher polish without too much difficulty. The cross is, as Oakeshott describes as typical of the type, long and curved. It’s square in section, starting with an escutcheon and flaring out gently to squared-off terminals. 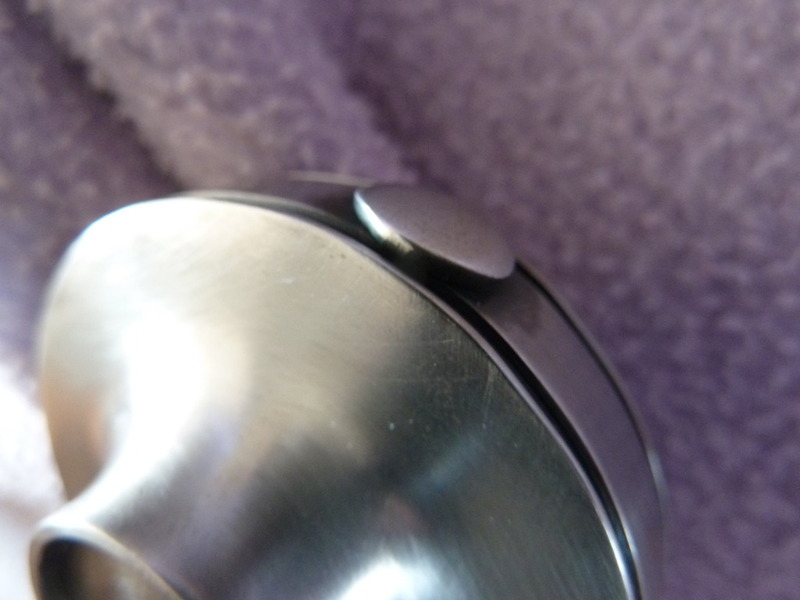 Both the escutcheon and terminals are file-worked to give the otherwise simple guard a bit of bling. The file-work on one side of the escutcheon isn’t quite straight – but this isn’t easily noticeable and really contributes to the sword’s handmade aesthetic. The blade slot is very neat: there is a small gap between the blade and the cross, but it really is very small, and is very well done: no hatchet-job here! There are visible polishing marks along the length of the cross, to a level in keeping with the finish of the blade, so the two gel very nicely. I have no doubt that these marks could be removed and the steel brought to a higher finish if I really cared about them… but I don’t! There is no wobble, and the whole assembly is very tight and solid – with the sword suspended and the blade struck, it has a very satisfying ring to it – a sign that the sword is well put together. 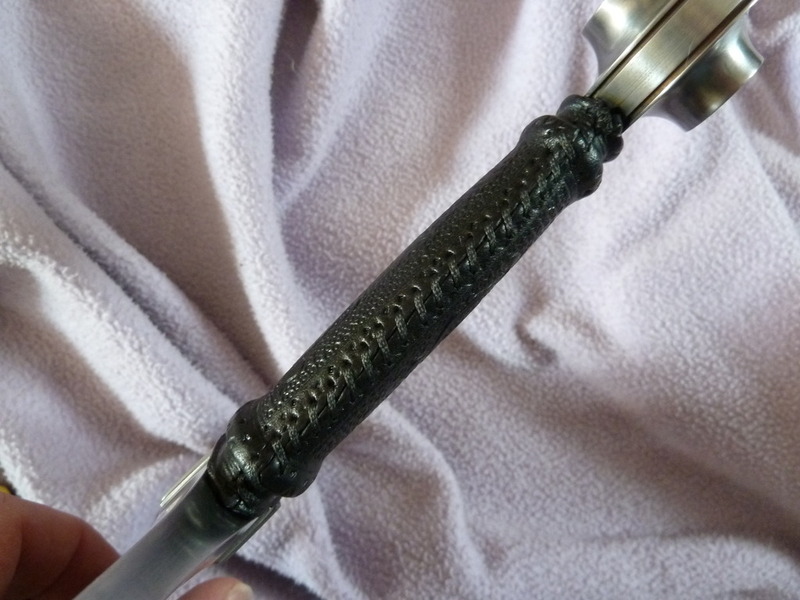 I was very excited about seeing this, as it was my first tooled-leather grip. I was very impressed! 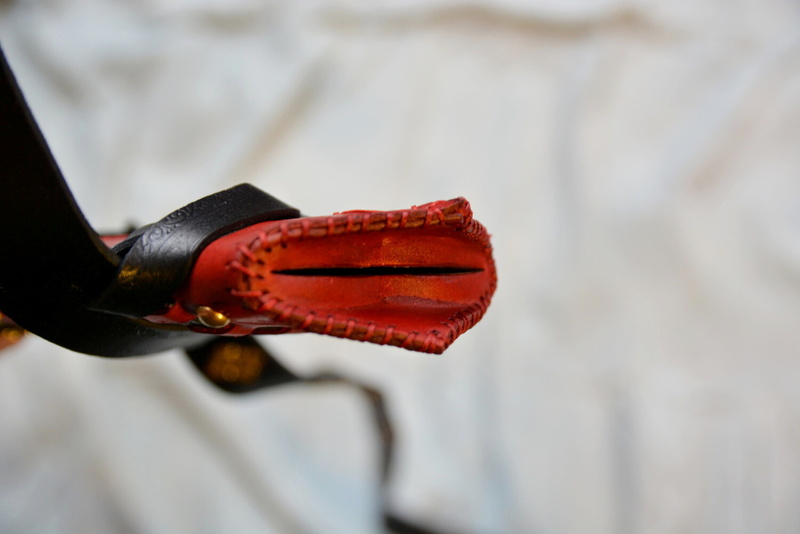 Mateusz has tooled the leather on both faces of the grip, with the stitching running down one edge, and a rope-work design decorating the other. The leather is very thin, so I’m not sure how he managed to get the detail done without cutting through, but he did! There are two risers on the grip: one at the top, and one at the bottom, and, as with everything else on this sword, it is tight and functional. I was worried that, with handling the sword, the tooling might fade. But I’ve had it for about a month now and it’s still as fresh as ever. I wish that I had requested a lighter coloured dye on the grip: maybe a red or brown, as this would really have made the tooling design pop! The pattern is still very distinguishable, though, and the black dye precludes the possibility of discolouration marring the finish. It wasn’t the end of the world, however, and after a bit of pressure with my thumb, the vast majority of the wood is now covered again, and doesn’t appear to have come uncovered since. I really like this pommel! It’s of wheel form, and the ‘hub’ is very deep and pronounced. I like wheel pommels: they are comfortable, decorative, and allow you to be instantly aware of your edge orientation. Mateusz incised two lines around the outer circumference of the pommel, and either left them blackened, or blackened them on purpose: this provides a nice contrast to the bright steel of the pommel. There is a recess on either side, with ample space for a coin, token, or so on. I was considering getting something made/ making something, but as yet I have not decided what. The peen is, again, very neatly done. It isn’t counter-sunk and polished flat like an Albion: it is neatly peened over in a mushroom shape, standing proud of the pommel. It’s unobtrusive and does what it’s supposed to. I believe that the pommel may have been turned instead of forged (perfectly acceptable to my mind! ): it’s perfectly circular, and there are slight signs of machining still evident. Again, the polish is of the same standard as the blade and the cross: nice, but not so nice that I need to worry too much about maintenance. The sword did arrive with some rust-marks on the pommel, but they were easily removed with some brasso wadding. This is another feature of Mateusz’ work which endeared it to me: the inclusion of a very well done scabbard and suspension system. 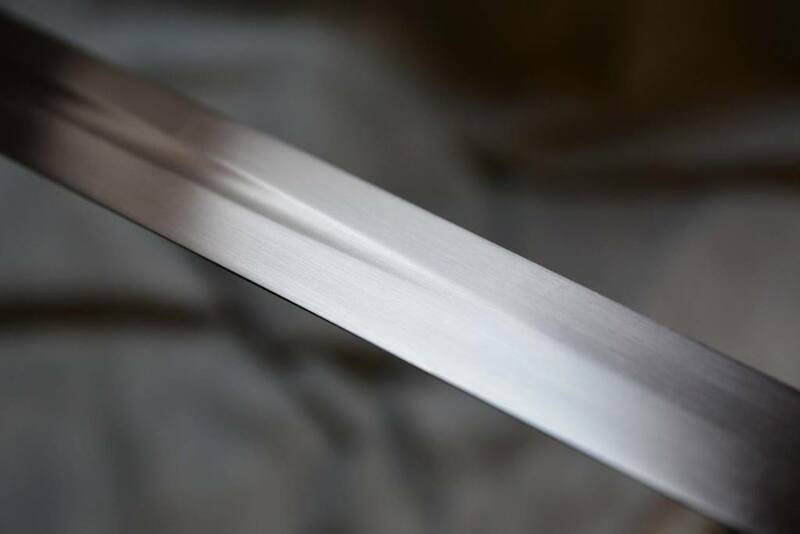 We are all used to lower-end swords coming complete with terrible one-size-fits-none, ahistorical scabbards; and higher-end swords don’t tend to come with them at all; but with Mateusz’ work he seems to have spent as much time on the scabbard as he has the sword. 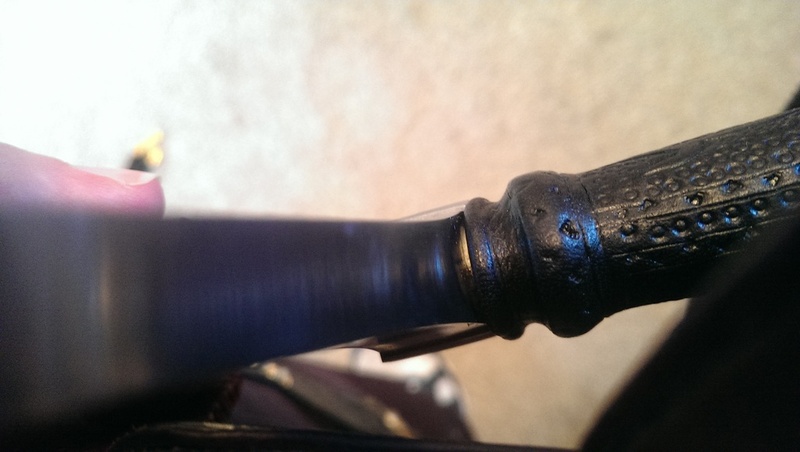 The thickness and added weight of the scabbard, however, help to keep the sword balanced nicely while carried. I’m not sure if this is on purpose or not, but it works and feels good on the hip. 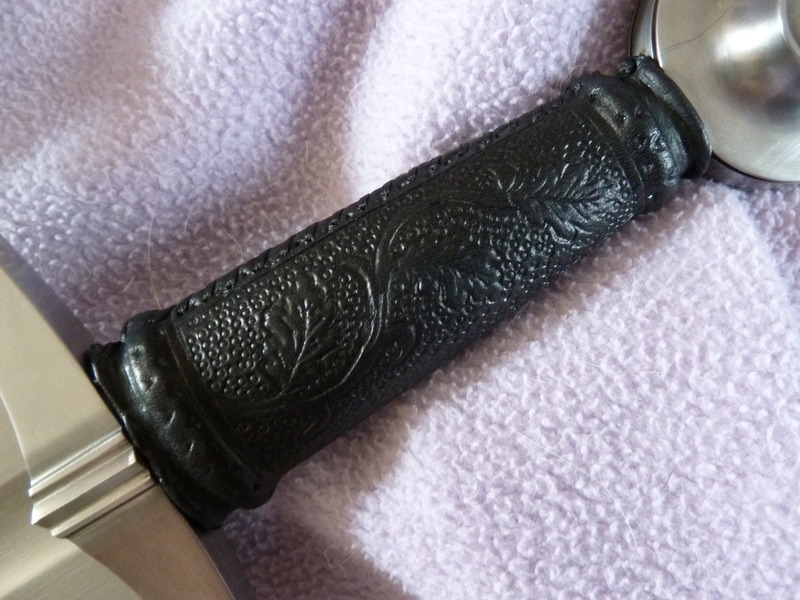 Mateusz’ tooling on the grip carries on down to the scabbard: oak leaves and acorns are the main decoration, with finer tooling accents surrounding them and adding texture and depth. 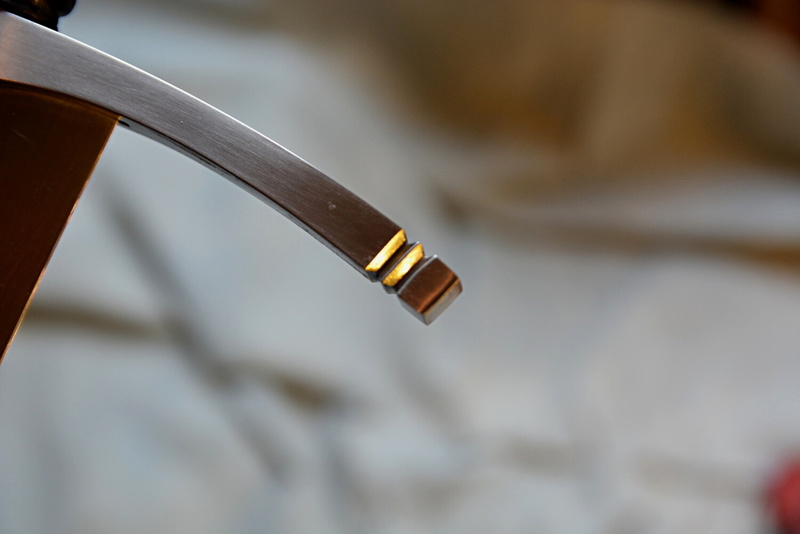 The brass pins add another bit of class to the scabbard, and tie in nicely with the belt stiffeners and buckle. 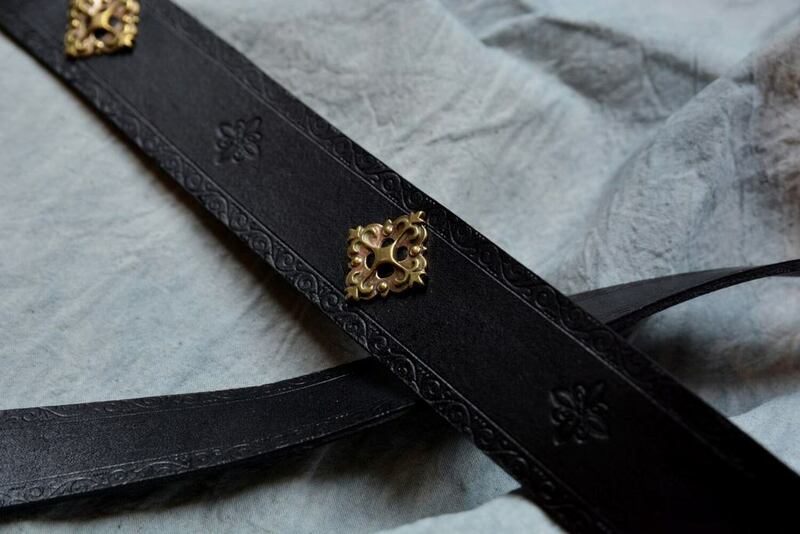 The belt is also tooled along its edges, and suspends the scabbard in the inter-laced style. All in all, it makes for an extremely handsome package! The time and care taken in making the scabbard isn’t just visible on the outside: Mateusz lines his scabbards – either with felt or wool, I can’t tell which – allowing the sword to slide smoothly in and out. The sword is not held terribly snugly in the scabbard, however: don’t get me wrong, it doesn’t rattle, and feels quite comfortable in place, but if held at an angle the sword will fall out. I cannot speak too highly of Mateusz’ prompt, courteous, and friendly communication. Although these were initially via Facebook, he was happy to e-mail me once he found out how Facebook-illiterate I was. 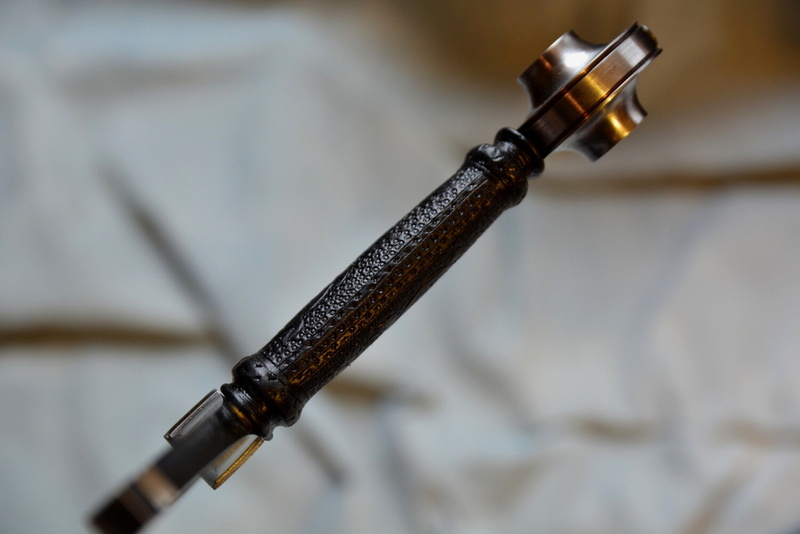 Responses to queries were always received within a day – usually a couple of hours – and he was very quick in sending me progress shots, and more photos once the sword was completed to check that I was happy before shipping. I also think that the speed with which he processed the order – 23 weeks from the end of October to the start of April – was commendable. I would not shy away from a wait of a year and up from a custom sword-smith, so this speed was certainly a breath of fresh air. I believe that, had he not had trouble with the company who provided his heat-treating, it would have been all the faster. I will not discuss cost in this review, but I think that the sword and scabbard package was excellent value for money, and I wouldn’t hesitate to commission something from Matteusz in the future. I just need to start saving my pennies! Beautiful sword, beautiful package in fact. There is something really pleasing about the proportions. Well done both of you! Fantastic review of a beautiful sword. Thank you! 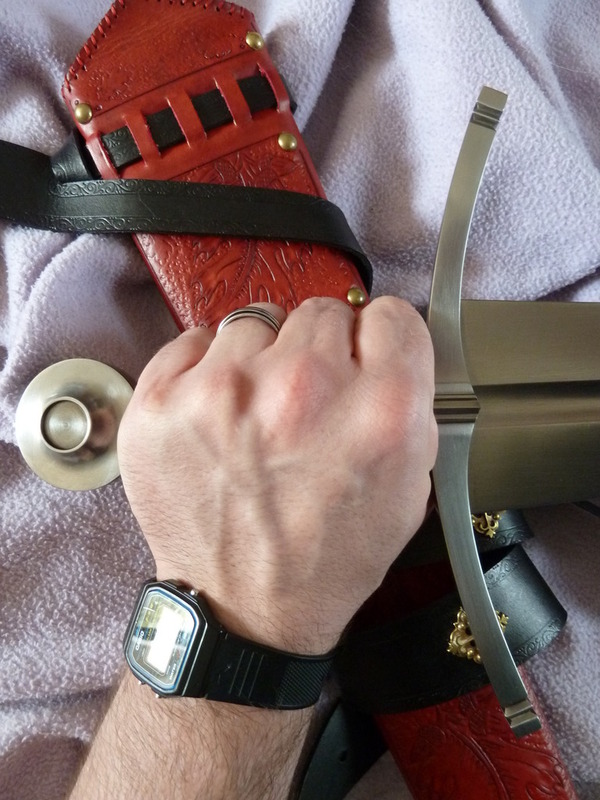 Nice review and great looking sword - thank you! Congratulations on a fine sword and thank you for the review. Your experience with Mateusz mirrors my own. He seems to be taking his work to a new level with his latest efforts. I think we'll see good things from him in the future. Thanks, all, for the comments - it's a pleasure! I agree with you, Patrick - this sword is really nice, but I'm excited to see what Mateusz comes up with in the future: his more recent pieces are showing how quickly he's increasing and improving his skillset and getting better and better.